Keratex Nail Hole Damage Repair is a great item for your grooming kit. Using the specially designed precision nozzle, simply squirt the liquid into new, old or stressed-looking nail holes to flush them with this instant cleansing and repairing solution. Once you have flooded the nail holes, the liquid gets to work, flushing out and repairing the nail holes, also cleansing and hardening both the interior and the point where the nail entered the hoof, ensuring that existing damage, gaps or rips will not develop further and will not ‘ladder’ up or across the hoof. 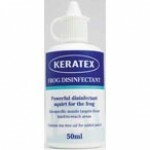 Keratex Nail Hole Damage Repair is available in a 200ml squeezy bottle.